Four track 7" featuring 2 songs each by The Magnificent (UK) and Noise By Numbers (USA). 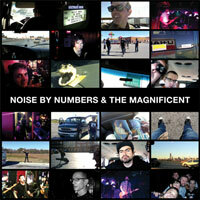 Noise By Numbers feature Dan Schafer (Screeching Weasel, The Queers) and Jeff Dean (All Eyes West and The Bomb) and deliver tow amazing Pop - Punk classics. The Magnificent not to be out done hit back with two gritty singalong anthems. Released after The Magnificent toured down to The Fest with The Bomb and Noise By Numbers. 500 Released on 5 different colours.